I do wish I could find a staple lipstick, but for the time being I'm a lip gloss girl. And with that being said, I guess I should mention that I have dozens of glosses. I think I probably carry three or four in my purse at the same time. And most times, the color payoff is pretty much the same for all of them. Not very much. They just give varying degrees of glossiness or shine and I like or dislike them based on the formula consistency and the maturity factor (i.e. I don't do gaggles of sparkles). 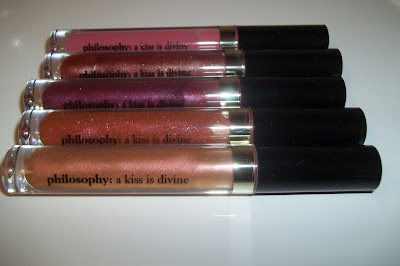 A few weeks ago I was once again lured in by the host at QVC as they showcased the Philosophy Divine 5 Piece Lip Gloss Blockbuster. A bunch of glosses, that sound like a bargain, and sold for a limited time in that set - sign me up! And during the broadcast the Philosophy rep mentioned that the applicator brush would be stiff on the first use. Well, I thought it was stiff as a twig the first, second AND third use. And I'm curious as to why they didn't go back to the drawing board with that instead of marketing it as a "we know it's stiff, but it's ok" situation. That's corny. They may have well just gone with a regular ol' doe foot applicatior and called it a day. Needless to say I'm not keeping this almost $50 "blockbuster" for two shades of gloss that I could find at my local CVS. 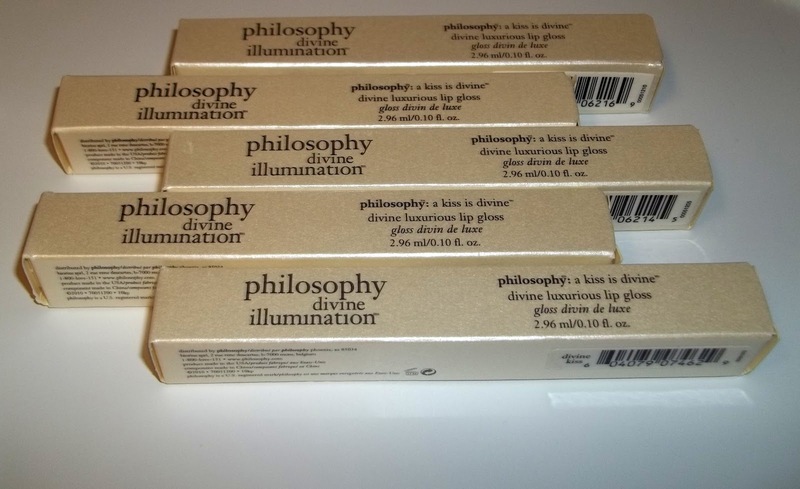 I'm not a Philosophy girl yet because they haven't quite been able to win me over. 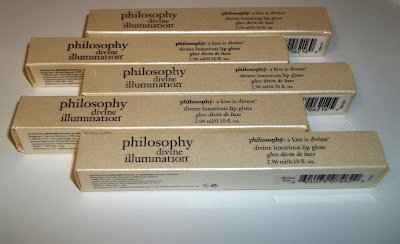 I keep giving them a try though I usually end up sending the stuff back, so I only regularly use a product or two from their line (loves Divine Illumination Highlighter). But for this one, I'm going to have to give them a thumbs down for overall execution and delivery. Maybe they should stick to the body wash business...for now I'll keep reaching for my Victoria's Secret Brilliant Lip Shine in Rock Me.